Far from the usual organised trips, we suggest you discovering the Moroccan traditional know-how by meeting men and women who daily put their know-how into practice. During our WORKSHOPS, you can observe, but above all practice and exchange with the craftsman. You will be taken during few hours in a totally unusual atmosphere: the decoration, the men, the activity ... everything is there to offer you an absolute ambience and make you live a rare experience. Other option: our MINI-TOURS. They offer you the opportunity to discover 3 traditional craftsmen and their occupation, techniques and raw materials implemented, features that make the production's quality. By attending the current work, you have the opportunity to ask your questions and come into contact with the craftsman and his team. For us, one commitment: to work in the respect of the authenticity. That's why our workshops and mini-tours always take place at the usual craftman's working place and are only organized for very small groups. Our offer is an opportunity to discover one or several traditional know-how, all the surroundings and the ambiance of the Moroccan craft work; but above all, it's a meeting with a craftsman and his team who guide you in your discovery. "Cher Bouchra,We loved meting you and visiting your home, thank you so much for your hospitality and your wonderful cooking. Our lunch was fabulous!! Susan & Meredith PlainePS: thank you for taking Meredith on your motorcycle!! " 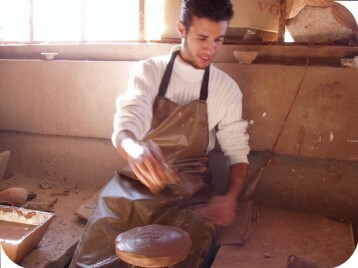 The workshop pottery is a part of famous Moroccan classical crafts. in Safi, Fes, and Marrakesh, among others, they are many to produce the plates of zellige, and the traditional usual pottery. The training course of pottery which is proposed to you allows you to understand the two different shaping techniques the most practised in morocco: the turning on the famous traditional potter's wheel and the technique of the molding. It is also the opportunity for you to observe all the workshop's organization since the first clay preparation, until the firing and the enamelling of potteries. - demonstrations and explanations split into two times concerning the clay preparation then the phases of pottery's work: firing ; enamelling stage. - souvenir gift from the workshop. Every day at 9 am. For any specific demand, please contact us. This brassware workshop takes you to the meeting of the main techniques used for the brass work. Mustapha and his team works the brass shaping (technique of the "tatbailit"), the hammering, and the engraving of traditional drawings (technique of "zouak"), mixing of arabesques and geometrical forms. During the workshop, you also observe the other secondary activities, as the soldering of pieces, the polishing, and you soak the workshop's pace up. With the assistance of Mustapha, you work the engraving of a traditional drawing on a brass plate; you practice then the techniques of the tatbailit ("shaping") and of the hammering so as to realize a second object. - a souvenir gift from the workshop. For any specific request, thank you for contacting us. Here is the training course which does well to you: due to it's naturally discovery side; but also because the Al Kawtar association which receives you in its workshop cultivates well-being and serenity. The works of embroidery are realized by disabled women who practise all the techniques. You can thus choose among a wide range of drawings to realize your manual labour. Every day at: 9:30am or 2pm . Our tadelakt training course will allow you to discover all the steps for the application of this coating on two types of support: pottery and wall support. You are at the coating and colour preparation ; you work the hanging: "dressage", smoothing, patina, on pottery and wall; you also learn to waterproof coating and to ensure a good maintenance. Our tour "to the potter's village" takes you during 3 hours in the centre of a very authentic village devoted to the Moroccan crafts, just near Marrakech city. The program: Mustapha, ingenious POTTER for more than 45 years; Zakaria, craftsman specialist in TADELAKT on pottery, whom the main part of his productions is exported to Europe; and Mohamed, BASKET MAKER for 30 years. For each craftsman, you discover the workshop, his organization and the environment in which it joins. What are the techniques and raw materials implemented? What are the characteristics which make the quality of the various observed crafts productions? By visiting in detail each workshop, by attending the current work, all these issues are approached. A large space is also reserved for the meeting:you have the opportunity to come into direct contact with the craftsman and his team, to ask questions and discuss the topics you are interested in. As our workshops, our tours are only organized in small groups of 6 persons maximum. They are conceived according to techniques used by the professionals of training (the holidays spirit extra!) for your comfort and to give you the TIME to live and to appreciate your discovery. We alternate explanations, demonstrations and propose you even some moments of practice, if you wish, thus making your visit very lively, varied and fun, far from formatted and monotonous speeches. - guide in charge of translation and good progress of your tour. - two-way tickets by a 4x4 transport agency. Every Tuesday, Thursday and Saturday at 9am. This training course of basketry is an invitation to rest: no machine, very few tools, only hands work the vegetable materials. The kindness and the quiteness of Mohamed do the rest: you enjoy 4hours of relaxation. The basketry workshop which we propose will allow you to discover two braiding techniques from common two local raw materials in Morocco: the doum palm leaves, and the reed stems. In the quite ambience of the basketry workshop, you will discover the ambiance of the basketry: all the vegetable materials implemented, the new design and new made objects, and also the surroundingof the workshop, simple and natural. - explanations concerning the various raw materials used by the craftsmen basketmakers. - a souvenir gift made within the workshop. For any specific request,please contact us. Our cooking classes at the inhabitant are a real happiness for the culinary tradition's lovers: organization of the meal, choice of recipes, cooking on wood fire, even the used utensils (pottery), remind us how was the Moroccan cooking few decades ago, and the way it's still applied in the region far from the big cities. The meeting is in favour as usual: the discovery of these old practices is led by women who make you discover the ordinary life of a Moroccan family, beyond the cooking. Our workshops cooking are real classes: besides practice, we hand the recipes of each culinary preparation over you. They are also conceived as moments of relaxation and cultural discovery, when after the class comes the moment of tasting. The inhabitant opens his Moroccan living room to you, the opportunity for you to discover the codes and the customs of a real Moroccan meal. - recipes of all the preparations. To choose your menu, or for any specific demand, please contact us. The Fondouk is the name given in the Maghreb to the "caravanserail" ; appeared in Marrakesh in the XIIth century, the city still hold a hundred. Our tour " To Fondouks " allows you to discover 3 craftsmen working in two renewed fondouks inside the Medina. Your visit will lead you to the meeting of 3 craftsmen: the LEATHER WORKER;the WOOD TURNER; and BRASS expert craftsman. From the famous tiles of zellige of Fes, enamelled by colors, the zelligeur (craftsman) cuts, creates lozenge (diamond-shaped) , stars, squares, which will then assemble together. he also scratching through enamel to make beautiful drawings. During this workshop, you discover the practice of these various techniques. The place hosts a dozen of professionals. Abdou ou Mustapha explain the particularities of the various zelliges and assembly techniques. The mosaic of zellige and the workshop's surroundings, this workshop reveal all its secrets for you! - creation-souvenir made within the workshop. The Berber jewelry inspired fall in the ethnic trend. Work on silver or bronze, blending geometric or floral designs, these jewels are among the most characteristic of Moroccan jewelry. Jamal, craftsman, has obtained technical skills that earned him several times as the best craftsmen of Morocco. He has a great knowledge of the history of Moroccan jewelry and hosts regular professional training. He offers all thehis know-how so that you can make your own creation. famille Plaine, le 31 d�cembre 2010 "fabulous lunch! " "Cher Bouchra,We loved meting you and visiting your home, thank you so much for your hospitality and your wonderful cooking. Our lunch was fabulous!! Susan & Meredith PlainePS: thank you for taking Meredith on your motorcycle!! Diana & Jeff Gordon , le 18 d�cembre 2010 "cooking class"
driver who never returned.This day, cooking was much more than we expected in ?hands on? real cooking with a delightful woman.We will send you our photos of our time cooking?. And eating Best,Diana & Jeff Gordon "
Mathilde + Annick, le 08 novembre 2010 "Moment inoubliable de notre séjour à Marrakech"
Michael, le 22 octobre 2010 "cours de cuisine avec le tour du marché"
l�a & Benj, le 17 ao�t 2010 "découverte culinaire fantastique"
xceptionnel et un très bel après ?midi qui restera gravé dans ma mémoire, j?aurais aimé rester beaucoup plus longtemps, j?espère pouvoir revenir un de ces jours....Inchala et encore merci beaucoup! !Shucran,Bikolo soror Léa & benjamin "
Dustin , le 13 ao�t 2010 "incredible dishes "
Buxy-pot, le 24 mai 2010 "Cours de cuisine berbère"
les hommes, ce qui permettra sans doute à chacun de se Rafraichir dans la cuisine pour préparer des mets de rêves,Encore merci à toute la famille qui nous a reçu comme des amis"
Le Clos des Merveilles, le 19 avril 2010 "Cours de Tadelakt"
est ponctuel ; Nous sommes trois stagiaires et l'organisateur nous prend totalement en charge ; il nous conduit dans la quartier des poteries à la sortie de la ville ; quelques explications de la part de Zakaria et nous partons pour trois heures de labeur sur de la poterie et pour finir sur une partie de mur ; le thé et les petits gâteaux locauxofferts par l'atelier d'ailleurs sont les bienvenus ; un résultat magnifique, des intervenants chaleureux et attachants....activité à faire et à voir...car on est loin de s'imaginer qu'il faut avoir une sacré condition physique pour réaliser du Tadelakt quotidiennement, et que les outils utilisés sont si rudimentaires ; je vous invite sur mon blog pour de plus amples explications et visualiser quelques photos http://leclosdesmerveilles.unblog.frCordialementRaquel"
Jerry & some , le 09 avril 2010 "l"
ute;péter à la maison (délicieux couscous !!) Merci mille fois pour l'accueil chaleureuxJerry & some"
Catherine , le 27 mars 2010 "cours de cuisine chez l"
fran�oise, le 26 mars 2010 "réalisationpar soimême "
gazelle84, le 09 f�vrier 2010 "un moment authentique"
sur bois)et chaque atelier fût un vrai moment d'authenticité. Personne n'essaie de nous vendre quoi que ce soit pour une fois!! A faire et à refaire..."
Evelyne, le 02 f�vrier 2010 "une demi-journée très enrichissante"
c vous lors d 'un prochain voyage car d 'autres activités m 'intéressent . Merci . " HOLLENBECK, le 04 octobre 2009 "Excellent !!" Chaleureux accueil, très bonne ambiance, repas excellent !! LesJollys, le 01 mai 2009 "Atelier vannerie"
"Très bon stage de vannerie de 4h. Merci à nos enseignants et nos traducteurs pour leur calme et leur patience.Mon mari et moi même avons beaucoup aimé ce moment de partage et d'apprentissage.Encore merci à tous !! !